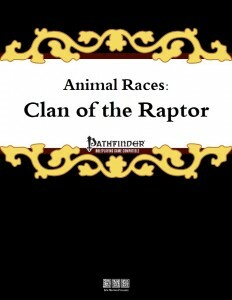 We begin this installment of the Animal Races-series with a compelling piece of prose describing one of the ritualistic dances the members of the Raptor Clan perform before diving right into the usual physical appearance, age, height and weight tables etc. Members of the Raptor Clans are humanoid with the shapechanger and Garuda-subtype and may be either medium (+2 Dex , -2 Str) or Small (same attributes + size bonuses), regular base speed (30 ft. medium, 20 ft. small), low-light vision, a primary bite attack at 1d4 (1d3 for small raptors) and natural AC +1, scaling up to +2 at 1oth level. Additionally, members of the raptor-clan can assume the form of a bird of your size as a supernatural polymorph effect. This eliminates all but appropriate natural attacks and can be maintained 1 minute per character level. Changing shape is a standard action and does not provoke AoOs. Now, as you all know: Unassisted flight at 1st level is usually a big no-go for me (and a bunch of DMs out there), mainly due to modules usually not being written for this kind of power. That being said, the daily cap as such renders this a more viable option here and over all, I’m inclined to allow it in my less low-powered games. As always, there are further customizations for the clan presented, subtypes, if you will. This time around, we have a selection of 4 subtypes: Eagle Clan members get +2 to Cha and treat all instances of lawful good in the paladin’s class description as “chaotic good” – they may also select the heritage feat as a mercy. I get what this tries to do – make chaotic good paladins. Alas, if it were that simple, there wouldn’t be so many different takes on the trope. Let’s begin with detects, smites etc. – shouldn’t e.g. smite apply to lawful evil instead? The concept is certainly not new and I get its appeal, but that does NOT work via a one-word substitution. Ideology, code of conduct etc. – a LOT changes and quite frankly, I believe that these humble, well-intentioned lines open a HUGE can of worms of issues for any GM who thinks that’s all there is to the concept of a non-LG paladin. Highly problematic. Hawks get +2 Wis and may select the heritage feat in lieu of an inquisitor’s teamwork feat – but not retrain/change it. Nice mechanical pitfall avoided there! Owl clan members also get +2 Wis and may use Wis instead of Cha as governing attribute for oracle class abilities as well as take the heritage feat instead of a revelation. This is a teeny tiny bit stronger than the default since Wis governs Will, but I can live with it; concept-wise it makes sense to me. They also have their own Heritage feat. Finally, vultures get +2 to Int and +4 to saves versus diseases, but reduce their fly speed granted by their bird shape by 10 feet. They also have their own heritage feat, which can be taken in lieu of hexes. The racial heritage feats allow the respective raptors to increase their bite attacks to 1d6 (1d4 if small), gain scent (only vultures), +20 ft. fly speed, two primary natural weapons, talons, at 1d4 (1d3 for small raptors). Owls can also select to be treated as having concealment when flying, even when faced with creatures who have darkvision/low-light vision, provided the lighting is appropriately dim/dark. The traits available for all three also sport avid shapechanger, which increases the duration of the alternate shape to an hour per character level each time and makes the ability usable 3/day. Personally, I think this ought to be available later – the unassisted flight at low levels is strong enough; taking the limits away to this extent is imho too soon and should be relegated to the lower mid-levels. This holds true for all subtypes of raptors. The subtypes vary in which additional racial traits are unlocked: While all may select the true shapechanger that makes the shapechanges at-will and unlimited, owls and raptors, for example, can take raptor’s dive: Deal double damage on a charge if you began it at least 10 feet above your foe. Vultures may not select the flight-enhancers, but instead can select scavenger, which renders immune to all ingested poisons…and ingested diseases. While usually, diseases are not classified as ingested, inhaled, etc., I actually like this deviation since it provides more clarity than the default. Apart from avid shapechanger being available too soon, I have nothing to complain here. As always in this series, pure crunch mechanics is not all we get – instead, we are introduced to the genealogy of the raptor clans and their stance on several established monsters and creatures, firmly anchoring the clan in the lore of a given world – while I usually remain pretty silent regarding these sections, I felt a need to emphasize for once that they are an integral part of making the race feel concise. The deity presented would be a CN take on Horus, which feels a bit odd since Horus is usually depicted as pretty much an epitome of LG or LN virtues, but all right. As always with the series, we are introduced to the heraldry of the clans, which also double as race traits that go a bit beyond what one could get from regular traits – but at the cost of a minor drawback. No complaints here! Now here is where this pdf pulls out all the big guns, as it provides an array of immensely flavorful ritual dances – beyond being simple, yet awesomely flavorful cultural tidbits, they also double as a kind of unique, complex skill challenge that render the culture and interaction with the raptors so much cooler – I LOVE this section and, to me, it made the final section of this book so much more compelling. I really hope we’ll see more of the like! Eric Morton’s raptors are a significantly more fun array of races of races than I expected – the base race is more diverse and better balanced than I anticipated and the decision to make flight limited is a good one. That being said, I think the expansion of the alternate shape’s duration should be delayed to a higher level to maintain the unassisted flight-cap implicit in the rules. On the other nitpicky side, the CG paladin concept obviously does not work as suggested – AT ALL – so be aware of that. On the plus-side, the culture and the dances make the clans herein rank among the most unique and compelling in the whole series – which somewhat offsets these minor concerns. Hence, my final verdict will clock in at 4 stars.